TAIPEI CITY — The official competition schedule, tournament bracket and full list of venues for the WBSC Premier12™ global baseball battle were revealed by the international governing body at a press conference in Taiwan’s capital. 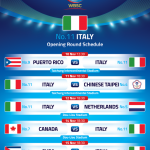 In November, the Top 12 countries from the WBSC Baseball World Rankings will unite for the first time ever in the Premier12 battle for pride that will challenge each nation to prove and defend its world rankings, with a US$ multi-million purse and large-scale bonus of ranking points at stake. Thirty-eight global games will be staged across Taiwan’s Taichung Intercontinental Stadium, Taoyuan International Baseball Stadium, Tien-Mou Stadium and Dou-Liou Stadium, and Japan’s Sapporo Dome and Tokyo Dome, in order to determine the ultimate baseball nation. Rivals world No. 1 Japan (2-time World Baseball Classic champions, 2014 U-21 Baseball World Cup silver medallists and 2013 U-18 Baseball World Cup silver medallists) and world No. 8 S. Korea (2014 Asian Games champions) will meet on 8 November in the historic Game 1/Group B opener. It will be the first time in 6 years that the star-filled/professional National Teams of Samurai Japan and S. Korea will face off against each other in what is sure to electrify the Sapporo Dome and set the tone for Premier12. World No. 2 United States (2013 and 2012 U-18 Baseball World Cup champions, and 2013 U-12 Baseball World Cup champions) and world No. 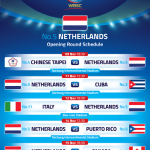 6 Dominican Republic (2013 World Baseball Classic champions) are also in Group B and will make their debut together in Taoyuan on 10 November. World No. 3 Cuba (2014 Central American and Caribbean Games champions, and 2014 U-15 Baseball World Cup champions) and world No. 7 Canada (2012 U-18 Baseball World Cup silver medallists and 2011 Pan-Am Games champions) are in Group A and will square off in Taichung on 10 November. World No. 4 Chinese Taipei (2014 U-21 Baseball World Cup champions and 2012 U-18 Baseball World Cup bronze medalists) and world No. 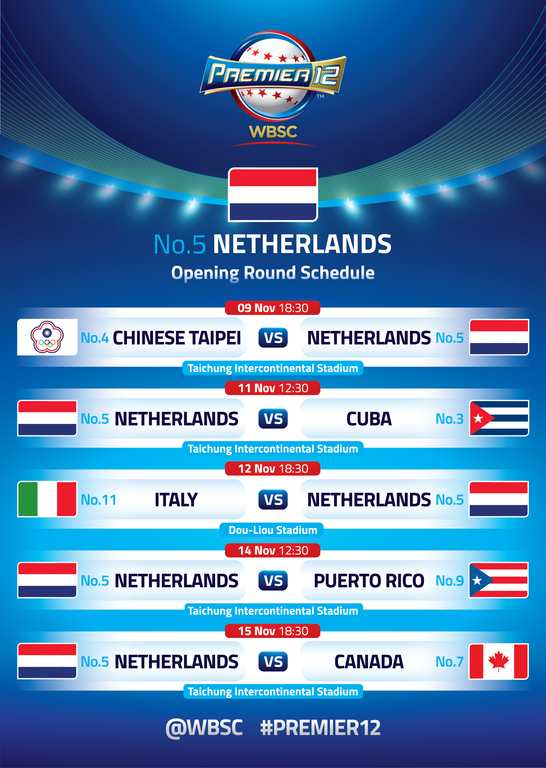 5 Netherlands (2014 European champions and 2013 World Baseball Classic semifinalists) will open Group A action on 9 November in Taichung for the day’s sole/featured. World No. 9 Puerto Rico (2nd place — 2013 World Baseball Classic) and world No. 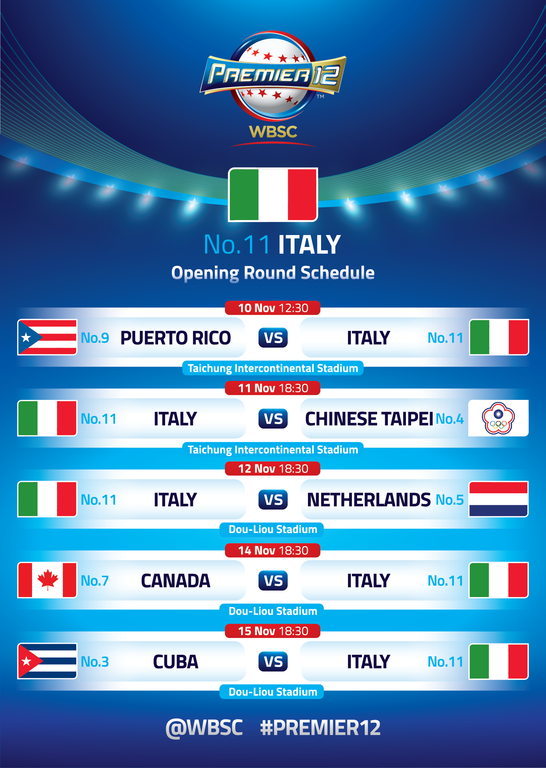 11 Italy (2nd place — 2014 European Championship and 2013 World Baseball Classic quarter-finalists) will meet for the first time since 2013 when they open against each other in Taichung on 10 November. World No. 10 Venezuela (2014 U-15 Baseball World Cup bronze medallists and 2012 U-15 Baseball World Cup champions) and world No. 12 Mexico (5th place 2014 U-15 Baseball World Cup and 4th place 2011 Pan Am Games). Four of the Premier12-nations will be sent home after the first round, group stage (Games 1-30) taking place from 8-15 November. The eight surviving nations will advance to the heated knockout stage where it’s Group A versus Group B on 16 November in the quarter-finals (Games 31-34). After the quarterfinal-KOs, four more nations will be eliminated and ushered back to their respective countries, while the four nations to successfully navigate through the first week of the Premier12 global battle will be flown from Taiwan to Tokyo for the climax of the event at the crown jewel venue, the Tokyo Dome, where the semi-finals — Game 35 on 19 November and Game 36 on 20 November — will be staged. The two countries defeated in the semi-finals will pair up for the bronze medal finale (Game 37) on 21 November, just ahead of the ultimate global game. Winners of Games 35 and 36 will earn a ticket to play on the highest stage, where a US$ million dollar cash purse, a large bonus of world ranking points and the decisive battle for their country’s national pride and honour will be on the line. 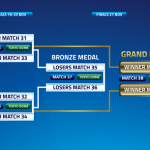 The two finalists will go head-to-head in the grand championship/gold medal finale on 21 November (Game 38). Nippon Professional Baseball (NPB) — the second highest-attended sports league in the world in 2014 (surpassing 23 million in attendance) — and world-class organisers Chinese Taipei Baseball Association (CTBA) are co-hosting the inaugural WBSC Premier12.